If you have been reading and following Rasa Malaysia for a while, you would notice that I am not much a carnivore. I prefer seafood, but I do like chicken a lot, especially chicken wings. While most people perceive chicken as boring, I personally think that chicken—with the right recipe and preparation—can be very versatile and delicious. And I feel very lucky to be a Malaysian because the Chinese, Malay, and Indians in Malaysia have many creative ways and interesting recipes when it comes to cooking chicken. Satay, ayam percik (Malay-style grilled chicken with coconut milk and spices), various Indian-Malaysian chicken curry, Chinese BBQ, salt-baked chicken, soups or stews, Nyonya food, the list just goes on. Everybody loves chicken in Malaysia. This past New Year’s Eve, my friend F at Salt & Turmeric prepared these turmeric and honey wings that have me craving for more since I tasted them. Coincidentally, the Asian market in my neighborhood has a special wings promotion, so I loaded them up on my shopping cart and made these honey wings myself. Superbowl is just around the corner, so if you are throwing a party, try something different this year. I am quite certain that these honey wings with turmeric will impress your guests. If you love chicken, please also check out other chicken recipes on Rasa Malaysia. Prepare the ginger by pounding with a mortar and pestle or grinding with small food processor. Extract the juice by squeezing with your hand and discard the ginger. Marinate the chicken wings with the ginger juice and all the seasonings above for 1-2hours. Grill or bake them in oven (at 375 degree F) for 20-25 minutes until cooked or golden brown. Serve hot. At Asian restaurants, chefs often pan-fried satay and then grill them over the stove top flame to get that perfectly charred surface. I baked my honey chicken wings for 20 minutes in the oven (when they just cooked through) and transfered the wings out of the oven. I then held the honey wing with a tong, and grill them over my gas stove top (set to medium heat). Voila. You've got picture perfect grilled honey chicken wings that are juicy and moist. I love the chicken wings!!! next time must try yours! I am immediately saving this recipe, plus sending it to my brother who’s simply mad for turmeric. Sounds fantastic and great photos too. Also, I’m convinced people who think chicken is boring are quite limited in their imagination. that is truly droolworthy. look so succulent yet crisp. mind passing me one pleeeeeez. Ooooo…I had the tumeric BBQ chicken wings during my trip to Malaysia last the summer. They were soooo delicious. Great tip about baking and then browning over the flame of the stovetop. Of course if you are making pounds and pounds of these chicken wings — which I would want to do, because the recipe is so luscious — it would be a labor of love to hold each one over the flame with tongs. But oh so worth it — I’m saving this recipe! An alternative to holding each individual wings over the stove top flame, you could pick up one of those propane torch attachments from the hardware store (you know the ones that plumbers use to solder copper pipes? ), attach a mini-camping (eg Coleman) propane tank to it and you can char all the meat at once on the baking tray itself. AHHH! Yet another great way of fixing chicken wings! My wife and I are adding this method to our collection of wing recipes. So many wings, so little time. That’s so funny, as I was reading this I was thinking to myself, “Ah, these would be perfect for the Super Bowl,” and I’m glad you agree. And thanks for revealing the secret techniques. if i had known earlier how much u like wings, i wud have made them everytime we meet up for makan2. lol! did the juice from the wings drip on the stove when you grill them? Aria – I love the middle section too, the reason why is not that meaty is the best part of all. Hehe. Big Boys – cool, you must try. Christine – let me know how they go. I love the ginger taste in these wings. Mandy – thanks for telling me about DMBLGiT, I didn’t even know until you told me. Shella – LOL, help yourself, two, three, four. Hehe. Ming – yes, Malaysian grilled chicken wings…oooh so good. I love belacan fried chicken, too, have you tried them? Lydia – well, you can spread the hard labor to like say, 2 of 3 people in front of the stove top, that would speed things up. LOL. Happy Cook – yes, chicken wings are the best part of a chicken. LOVE them. Docchuck – LOL. I can never get tired of wings though, so the more recipes, the merrier. Kenny Mah – No one can beat Wong Ah Wah chicken wings, I can’t decode how they marinate their wings…I LOVE them. Homesick Texan – hehe, great mind thinks alike. Princess – you have no idea…I love love love wings. Thanks for the recipe! Lovely technique, charring the chicken at the end. I will have a go at it myself soon. Only problem is, if I cooking 20 wings, it’s very time consuming. Turmeric and honey sounds like a match made in heaven, with the soothing heat of ginger..Yummylicious! Hi there, thanks for your msg at my old blog. Tumeric and honey sounds good. I have never thought of marinading with tumeric except use it to cook curries. gorgeous, and thanks for the “secret” techniques tips! i bet tumeric and honey are delicious together! I bet they had heightened flavour with the flames making direct contact with the chicken. In Guyana, fresh poultry is fire-roasted (just so the skin get slightly charred) and then cut up and prepared for cooking. I usually made mine with curry powder + turmeric + sambal belacan + honey. Yours is simpler and I’m so sure so yummy too! Finger lickin’ GOOD! haha since the secrets r revealed..does that mean they will murder u to keep u quiet before you reveal more?? just joking!.. I am sorry, but my husband spends his time posting on blogs and websites run by young women (usually asian women) and trying to chat them up. Please do not respond to him. Seriously. It never leads to anything good. This Malaysian turmeric and honey wings look so good. 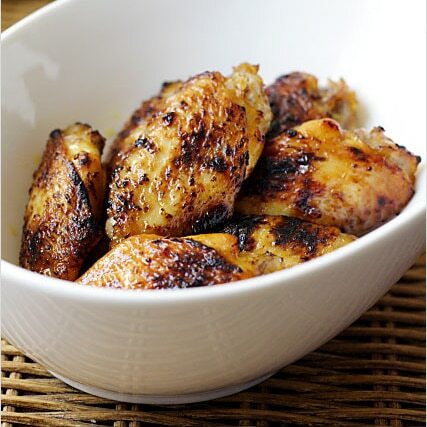 i will try to make it using your turmeric and honey chicken wings recipe. I’ve had this before. It’s out of this world! The chicken wings looks delicious…I will certainly try the recipe. Thanks for sharing. Been trying to find a good recipe for ayam percik. Any ideas? Awesome recipe, tried and taste great. This recipe looks delicious but I’ve made it and follow the recipe to the ‘T” and it turned out very bland. I mean very very bland. If you think it’s bland, double the seasoning ingredients to your taste. I just made these for the Bon Appetit reunion potluck and there were a big hit!